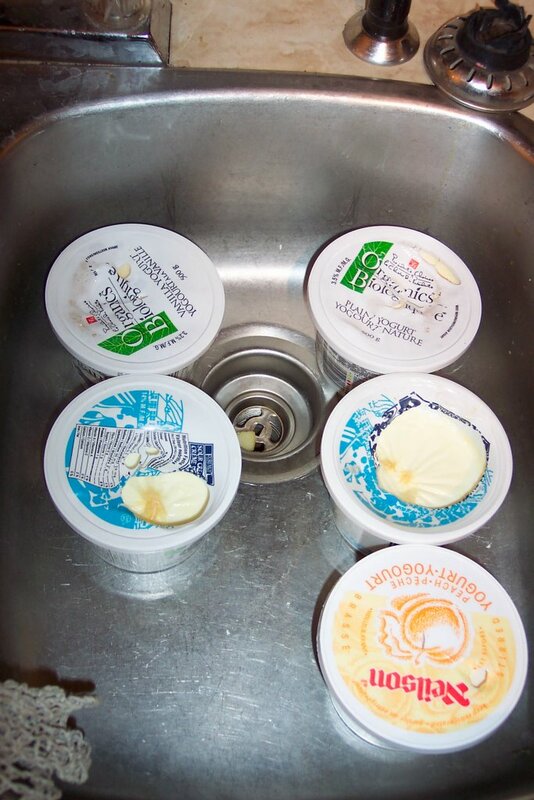 This is a picture of today's yogurt disaster. I have made yogurt many times, but only twice in this oven. And I AM SO FRUSTRATED WITH MY OVEN!!! I really need to invest in an oven thermometer, because it is always WAAAY too hot. Anyway, apparently it got so hot today that it melted the containers I was making yogurt in. I guess I get to make yogurt again tomorrow! Anyway, if anyone out there would like to try giving homemade yogurt a try, here's my recipe. It's really easy--hands-on time is only about 10-15 minutes, most of which is just waiting for your milk to heat to the proper temperature. Way cheaper than buying it all, too, especially if your family likes yogurt as much as mine does. Gently heat the milk to 180 degrees F, stirring often so it doesn't stick to the bottom. Cool quickly to 110 degrees by placing pot in sink of ice-water. Stir in yogurt and place in small, clean containers. (I find anything bigger than a 750 mL yogurt or 1 L Cool Whip container doesn't work as nicely. Or, you could place in a shallow glass, enamel, or stainless steel container.) Cover the container and place in a warm oven (110-150 degrees, but no warmer, or a gas oven with a pilot light. You can check your oven by putting a 110 degree glass of water in it for a while and testing it occasionally with the thermometer before you do this the first time.) Check after three hours, but I find the best results are usually between 5 and 6 hours. After a point, all it does is make more whey. However, every so often check yogurt and sop up whey with a paper towel (you can also pour it off and save it for other recipes, if there is a lot--like when I used that really cheap milk!) Depending on how hot your oven is, you can leave it for up to 12 hours. Yogurt is ready when you can tip it and it pulls firmly away from the side of the cup. Transfer to the refrigerator. You can sweeten an entire batch of yogurt by adding honey and vanilla after you stir the live culture in with the milk, or smaller portions by stirring it into each individual container. I have also put fruit and honey in the bottom of a container before pouring in the culture, but found this made the yogurt very runny, so decided to do it after from now on!